#010211--7 lbs. Traditional Gift Ham: A lean, boneless ham with a unique hardwood flavor. The Traditional Gift Ham can be used for any application. #010212--Paramount Ham: A delicious hickory-smoked ham made from natural muscles. The Paramount is perfect for carving on a buffet or slicing thick for ham steaks (13 lb. average weight). #010303--Traditional Spiral Sliced Honey Ham: This traditional bone-in spiral honey ham is hickory-smoked for a natural flavor. Glaze packet is included (8.5 lb. average weight). Golden Legacy Turkey Roasts from Michigan Turkey Producers in Wyoming, Michigan. These turkey roasts are proudly produced by local Michigan farmers. They are ready-to-cook roasts in an ovenable bag, complete with cooking instructions. These roasts are natural whole muscle cuts selected for texture, purity, and color, then seasoned and carefully packaged. 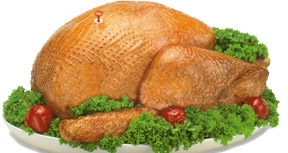 Golden Legacy Turkey Roasts are a convenient alternative to the traditional Whole turkey, maintaining the natural flavor and texture, while adding the convenience of being boneless. Select from three different varieties. Byron Center Meats ~ Gift-Boxed Steak Packages made in Byron Center, Michigan. *Other steak and gift box options/combinations are available by special order/request.